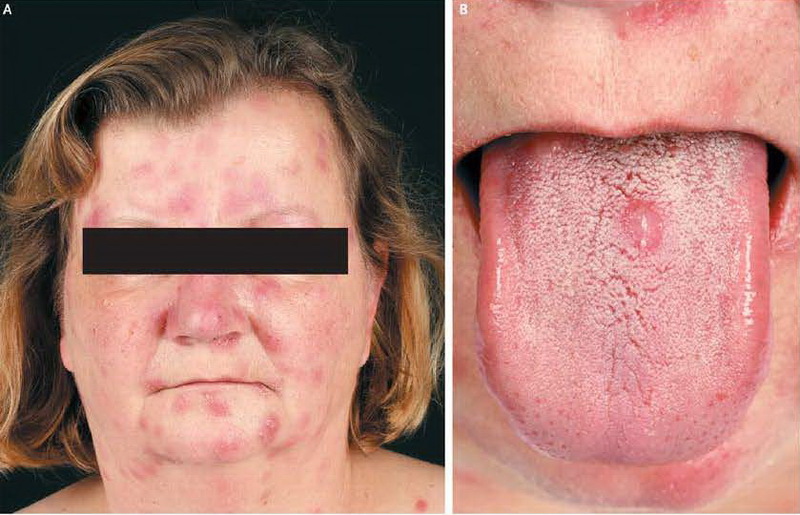 A 52-year-old woman presented with a 3-week history of asymptomatic erythematous papules and nodules. The lesions initially appeared on the face and tongue (Panels A and B) and subsequently spread to the trunk and lower legs. The patient had no other systemic symptoms. Two weeks earlier, she had been treated with oral penicillin G for a sore throat but had stopped taking the antibiotic after a few days because of angioedema. A biopsy of a facial lesion revealed an inflammatory infiltrate with multiple mature plasma cells suggestive of secondary syphilis. The diagnosis was made on the basis of a titer of 1:160,000 (normal range, 0 to 640) on a Treponema pallidum particle agglutination assay, a value of 5770 U per milliliter (normal range, 0 to 24) on an enzyme-linked immunosorbent assay for T. pallidum IgG, and a positive assay for T. pallidum IgM. The differential diagnosis included leukemia cutis and cutaneous sarcoidosis. The patient received the diagnosis of papulonodular secondary syphilis with mucous plaques and most likely a syphilitic pharyngitis. Because of previous penicillin intolerance, the patient was treated with intravenous ceftriaxone (2 g daily) for 3 weeks. The rash cleared within 4 weeks after the initiation of treatment. Papulonodular secondary syphilis in a 52-year-old non-HIV heterosexual patient. There has been a recent increase in the incidence of syphilis in Slovenia, similar to other countries. Secondary syphilis can manifest with various clinical and histopathological presentations. We report the case of a 52-year-old patient that presented with nonpruritic nodular lesions on the face, trunk, and insteps that clinically mimicked lymphoma or sarcoidosis. Histopathological findings showed granulomatous inflammation. The serology revealed positive non-treponemal and treponemal tests. Treatment with benzathine penicillin G was successful. This entry was posted in English and tagged Papulonodular Syphilis, Syphilis by kiumars. Bookmark the permalink.